The update to version 1.2 of VideosTone makes the Personalize Settings option available without purchasing the application…which is cool! 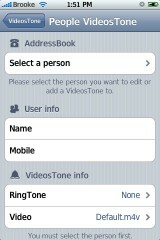 The Personalize Settings option allows you to apply Video Ringers to select contacts. When you choose the Personalize Settings option, you will see the Select a Person field…this will allow you to choose a contact from your Contact List. Once you have selected a contact, you can then select a phone number for that contact. It will automatically bring you back to the Personalize Settings screen and the contact’s Name and Number will be automatically added to the Name and Mobile fields. You can then choose the RingTone and Video you would like to apply for that contact. Another cool new feature with the update, is when you select a video, it will play a preview of that video. This helps in knowing exactly what video you are choosing. Once all the information is entered (Name, Mobile, RingTone, Video) you can go back to the Main Menu by selecting VideosTone in the upper left corner. 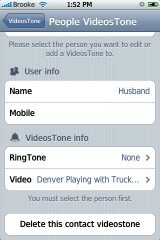 To customize another contact’s ringtone, just go back into the Personalize Settings field and repeat the steps. The only confusing part about this whole process is that it does not list which contacts you have changed. If you want to delete a contact’s VideosTone, you have to remember which contact it is, pull it up with the Select a Person field, select the correct number, scroll down and select Delete this Contact VideosTone. I have a feeling this could get confusing very quickly. You can get VideosTone through the iFoneTec source. There are a few apps that let you download videos, or you can SSH them to your phone. Yes you are an apple geek. Has anyone noticed how much this drains the battery? Depend on how many calls do you have ? it will be automatic disabled if under 10% battery. Additional question: how does this compare to vWallpaper which claims to also be a Video/Ringtone app? Tried to refresh my sources but cant seem to find the new update for VideosTone 1.2. Am currently on version 1.0. Anyone out there can help??? I cannot get the custom caller videos to work. I have triple checked that the settings are for the correct person but it still just plays the default video for everyone. I am having the same problem. I have worked on it for two days and still can’t get the customized videos to play for the contacts. I know I did it right. Help. The difference between vWallpaper and VideoTone is that vWallpaper is not playing the sound of the Video when the iPhone is in silent mode, VideoTone does not !!! Go to settings on your springboard. Click on it and scroll to the bottom. Has anybody gotten the customized videos to play for different contacts other than the default video playing for all calls? Now i have a question how do i add videos i have on iphone, like from mxtube or vwallpaper? or where can i download some directly to the iphone? Do I need to install the VT Update Patch with this update as well? I downloaded it to my iPhone and there seems to be no way to remove it or uninstall it!! Can someone tell me how to get rid of it? 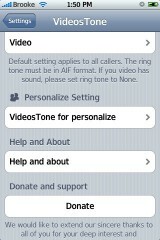 someone help, I can’t get the ringtone to work, what is a aif. File, how do I convert it? i have mobile finder and i have tried to put it in the var/mobile/media,videotone/video folder but nothing shows up. Any one able to get personalize videostone to work? I pick the name then video, but can’t get it to work. Just use defaults even with personalize one. ok this is what I has to do to get it to work. I uninstaled Wetool, then deleted all the custom contacts I had done and then did it again. When the video is previewing I double tapped on it a couple of times. Also add 1 before the area code on the numbers. Reinstal Wetool when you finish. Hope it works for you. 1 (123) 456-7890. I had to edit the phone’s contact list for it to work properly. It’s kinda weird but it takes a couple calls to get it working right. Personalized or not. Anyone else have this glitch too? First call is usually vibe only. With the 1..3 you can mute with the mute button and the up and down volume switch now controls the volume of the video. There is also one more free videotone with the update. Awesome. 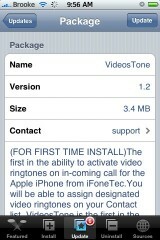 i have download the videotone app.but it didn’t show anything inside the setting app..any ideas? Hi, I downloaded SMSD but the program is not working – the icon is on the display and the program opens but afterwards it closing after few seconds again?? – I have the latest version 1.1.4 – what can I do to run SMSD?! – THANKS FOR YOUR HELP! !